Coarse-to-fine classification is an efficient way of organizing object recognition in order to accommodate a large number of possible hypotheses and to systematically exploit shared attributes and the hierarchical nature of the visual world. The basic structure is a nested representation of the space of hypotheses and a corresponding hierarchy of (binary) classifiers. In existing work, the representation is manually crafted. Researchers at CIS have introduced a design principle for recursively learning the representation and the classifiers together. This also unifies previous work on cascades and tree-structured search. 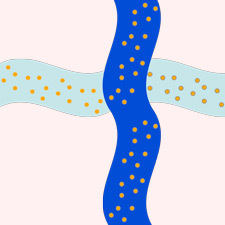 The criterion for deciding when a group of hypotheses should be “retested” (a cascade) versus partitioned into smaller groups (“divide-and-conquer”) is motivated by recent theoretical work on optimal search strategies. The key concept is the cost-to-power ratio of a classifier. The learned hierarchy consists of both linear cascades and branching segments and outperforms manual ones in experiments on face detection. 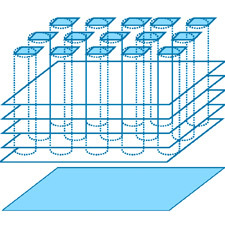 Nonlinear dimensionality reduction refers to the problem of finding a low dimensional representation for a set of points lying on a nonlinear manifold embedded in a high dimensional space. This problem is fundamental to many problems in computer vision, machine learning and pattern recognition, because most datasets often have fewer degrees of freedom than the dimension of the data. Although the goals of dimensionality reduction, classification and segmentation have always been intertwined with each other, considerably less work has been done on extending nonlinear dimensionality reduction techniques for the purposes of clustering data living on different manifolds. Researchers at CIS are developing algorithms based on algebraic geometry, graph theory and sparse representation theory for simultaneous dimensionality reduction and clustering. Graphical models define a framework that is designed in order to understand relationships within large sets of random variables. Learning them constitutes a challenge that needs to be addressed by properly combining powerful learning algorithms and extensive use of prior expert knowledge. 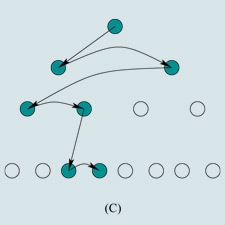 Such methods are developed and used in CIS to address computational biology problems, such as modeling gene and signaling protein networks, or computer vision problems, such as inferring interactions among visual cues that can be computed from images. 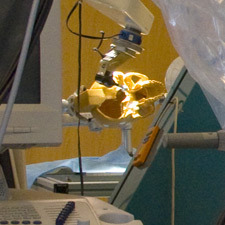 The advent of computer-integrated surgery technologies such as the Intuitive Surgical da Vinci system has created new opportunities to record quantitative motion and video data of the surgical workspace, This data can be used to create descriptive mathematical models to represent and analyze surgical training and performance. These models can then form the basis for evaluating and training surgeons, producing quantitative measures of surgical proficiency, automatically annotating surgical recordings, and providing data for a variety of other applications in medical informatics.